Without question the Vedder-Chilliwack is the most popular river on the lower mainland. It provides year-round recreation for hikers, kayakers and anglers. There are very few months that anglers can't fish for something. Winter steelhead start entering the Vedder in late November and continue to do so until May. In June, summer run Chinook salmon start their migration up this stream. Most Chinook are "white springs" and were introduced to the Vedder from stock taken from the Harrison. Overlapping these runs are very late running steelhead and very early running Chinook. In late September, coho salmon start running up the Vedder along with fall run Chinook. The coho fishing continues to get better until it peaks in late October. It's still possible to get a bright coho in early December, just when the steelheading is about to start. All the runs have been hatchery enhanced and its legally possible to keep hatchery fish. Besides salmon there are rainbow and cutthroat trout, Dolly Varden char and rocky mountain whitefish. Whitefish are under-utilized and provide great sport on light tackle. The Vedder-Chilliwack is not two separate streams like its name suggests, but simply a name change partway up the river. 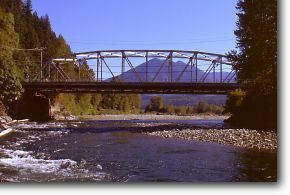 A bridge crosses the river where it leaves the mountain valley and flows onto the Fraser Valley flood plain. Below the bridge the river is called the Vedder; above the bridge it is known as the Chilliwack. Anglers usually refer to the whole fishing section simply as the Vedder. Above the Slesse Creek tributary the river is closed to fishing, and anglers refer to this section as the Chilliwack. No matter what you call it the river is wonderful. 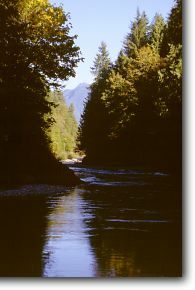 The Vedder is one of the top producing steelhead rivers in British Columbia. It is always crowded when fishing is good. Tempers often fray when too many people try to fish the same pools and don't follow procedure. When it's crowded it is necessary to time casts in sequence with other anglers. Fly casting and float fishing don't mix well because of different styles. When it is crowded, anglers aren't popular when they allow their float to drift way downstream and hang there. There is 36 km of fishable water below Slesse Creek, the upper fishing boundary. The lower river has been dyked and channeled, and there is a dyke trail from Vedder Crossing to the highway. It's popular with joggers, mountain bikers and anglers. Steelhead and salmon zip through shallow canal section quickly. They start to slow down in the pools near the end of Wilson and Lickman Roads. There is a parking lot at the end of Lickman Road. In this section the Vedder starts acting more like a river and less like a canal or ditch. The river is a series of gravel runs with deep water along the dyke bank. Steelhead and salmon hold tight to the bank in pockets created by large rock. Above Vedder Crossing the river is a series of fast water runs and pools. There are many boulders and rapids, but no serious falls. A paved road follows the entire fishing portion of the river. It is 10.5 km between Vedder Crossing and Tamahi bridge, the only crossing upstream. It is another 10 km to the fishing boundary. The Vedder is a popular stream with river kayakers and rafters, and there is even a competition course set just above Tamahi Bridge. Sometimes there is confrontation between boaters and anglers, but a little common sense should calm tempers. Kayakers shouldn't play in pools where anglers are fishing and fishermen shouldn't complain when kayakers slide quickly by. 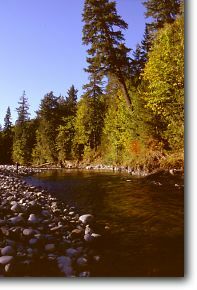 The Vedder has a long history of angling and many of its pools are named. Tesky's Rock, at Vedder Crossing, was named after a local angler who fished it every morning in steelhead season. The Camp Run, just below Vedder Crossing had a history of producing a large steelhead right at closing time during the famous Boxing Day derby. The Grenade Run was named after the Army's testing area. Millers, Way's Field, the Schoolhouse Run, the Dunbar Run, and the Boulder Hole are all favorite holding areas above Vedder Crossing. A bridge crosses the river just above Tamahi Creek, and a gravel road follows the far side of the river downstream for 5 km from the bridge. There is a forestry campsite near Tamahi and many access trails to the river off the gravel road. From the paved road side, much of the property is private and there are only a few access points. Above Tamahi, the Allison canyon pools are popular for picnics and fishing. They are great pools to catch whitefish in the winter. Above the Allison pools are a series of small bouldery pools and runs. At km 16 above Vedder Crossing there is the Correction's Branch Camp where access is denied for one km. At km 17.3 the Forestry has provided another free camp area at Thurston Meadows. It's very popular in the summer and the pool in front of camp is great holding water. But, the pool only has room for three anglers. At 19 km is a small parking area near the Borden Creek re-habilitation area. It is the trail head to the wonderful Ranger Run. 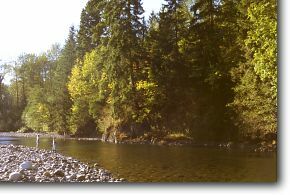 The big Ranger Run is located just above a long series of rapids and all salmonids stop here before heading upstream. A short distance above the Ranger Run is the Slesse Creek boundary pool, which is the last stop for anglers. All these famous steelhead pools bring back memories to hundreds of Fraser Valley anglers. During periods of very low water, salmonids don't like entering the shallow Vedder Canal. There is very little protection and few holding sections for quite a distance. Salmon and steelhead mill around in the Fraser River and mouth of the Vedder Canal. They move in and out of the canal at night. Anglers can access these fish by driving to the end of the road on the downstream side of the Hwy #1, then hiking downstream to the junction pool near Grassy Island. An alternative is to run a boat down from Island 22 campsite. Despite the crowding it is still possible to find water to yourself. Fish are constantly on the move and they hold in some tiny, bouldery pockets that only experienced anglers recognize. Even when fishing a crowded pool, a few fishermen seem to have all the luck. They are the ones who experiment with technique and a variety of lures or flies. In my early days with the Kingfisher Club I remember a few of the fellows who always seemed to catch a steelhead on the Vedder no matter what the conditions. It is no different today and there are MORE steelhead and MORE salmon than there ever was in the GOOD OLD DAYS. If I was stuck with limited time to fish the Vedder I would check at a local tackle shop for ideal conditions. Then I would pick a time in January for steelhead, July for Chinook and mid-October for coho. I would feel quite confident of success.